Bourbon is distinctly American, and we hold on to it as such. Just as the Germans protect their beer with laws we American do the same to protect Bourbon. We keep sacred Bourbons old fashioned ingredients, its distilling process, and the laws that define its character and its production. Some of examples of these laws are that bourbon must be mashed from at least 51% corn , aged for no less than 2 years in new charred oak barrels, and its distilled proof can be no higher than 160. Without these unique profiles protected, the bourbon industry may not have survived to be what it is today. 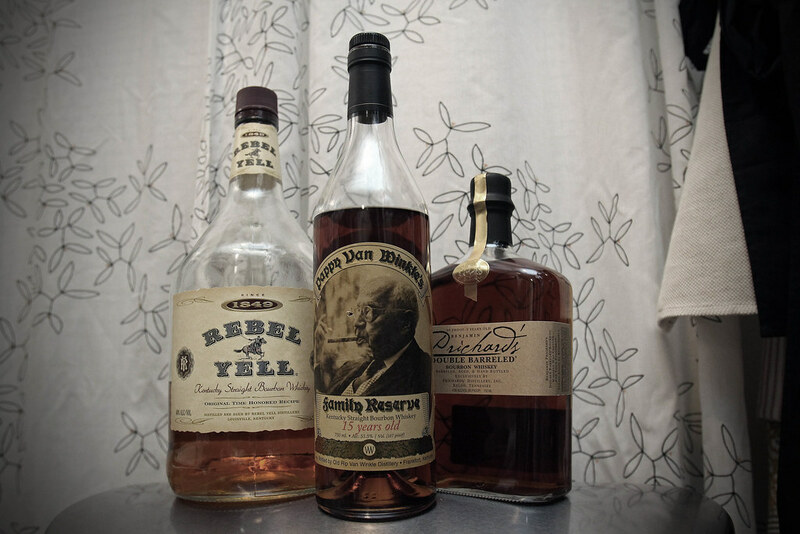 Considering the strong flavor contrast between wheat bourbons and rye bourbons one can only imagine what would have happened if the heritage of Bourbon hadn’t been protected so early on, even prohibition nearly destroyed it all. Defining laws or not, it doesn’t prevent folks from making bad Bourbon, that has always existed and still exists to this day and has plagued the industry, but there has never been more variety in the bourbon market like there is today. Although many have sipped Bourbon as the flavor of the South for generations, I’ll make the argument that it’s an under utilized cooking profile. Bourbon provides strong characters of vanilla, caramel, smoked wood, cracked pepper, tobacco, citrus, apricots, oak, butter and infuses that into whatever you are cooking. Pork stands up especially well to bourbon, drinking up all those beautiful sweet notes like a siphon for you to enjoy later. Often I’ll marinade a pork tenderloin in a bourbon brine over night for an even greater effect. Don’t be afraid to try bourbon with other things like duck, chicken and venison, it can handle it, but you may consider a quality bourbon to match the particular quality of meat. One thing to keep in mind is that wheat bourbons tend to be smoother and with sweeter notes while the rye bourbons tend to have a bit more complexity and have more heat with peppery notes to their finish. Bourbon is great in gravy, and I love replacing anything that calls for brandy with bourbon, try it and see what you think. Desserts are especially fun and where most people are comfortable when it comes to bourbon. There is a million recipes for punches, bourbon balls, cakes, and pies that call for bourbon in some form or fashion as an ingredient. Can I recommend you start thinking outside the box? Think about your existing dessert, and think about your flavors and try bourbon in things where you may not normally go? See where it leads you. Don’t be afraid to sample something new for the sake of learning; like that bourbon and figs is a beautiful combination ( it is by the way). You’ll be surprised at how many new flavors you discover when combined with the peppery, oak, and vanilla notes of bourbon to your everyday treats. Don’t be afraid to reduce a dark chocolate sauce down with bourbon instead of brandy or cognac, you’ll be pleasantly surprised. I said it’s our heritage and I meant it. If we hadn’t had Bourbon we wouldn’t have had Sweet Tea. You see, Sweet Tea was born out of something call Tea Punch. A sort of sweet rum/bourbon alcohol driven beverage before all the green tea dried up and we all began drinking black tea following the 2nd World War. So for Southerner’s it all began with a tall sweet glass, distilled full of flavor, heritage, and a recipe that is protected to this very day. Bourbon is an American treasure born in the South, a flavor rich in Hungry Southerner Tradition. Stay Hungry Y’all ! Now I must have bourbon. Is it bad that it’s 10:24? It would be ok if it were a Game Day, so why not on a Friday? Eh, I’ll wait. Great article! It’s fine. Live a little. Well coming from the man who may or may not be converting a water fountain into a bourbon fountain I’ll treat this as GOSPEL !